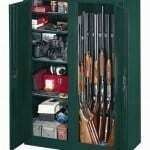 A gun safe is a practical solution to a safety and storage issue for your firearms. Many of the gun safes that are promoted today, however, are stand-alone safes that draw attention to themselves. If someone with a bit of knowledge recognizes your gun safe and they have the right tools, you might find yourself disarmed without realizing it. This is where the advantage of an in-wall gun safe comes into play. With these in-wall gun safe reviews, you’ll be able to protect your firearms and your valuables quite effectively. The goal for an in-wall safe is that it should provide you with a high level of concealment without restricting your access. The chart below offers you some of the best options in this category that will do just that. When you’ve got an in-wall gun safe, then you’ve got one of the fastest and most concealable ways to store a firearm in your home. In-wall safes can come in virtually any size, any capacity, and have whatever type of lock you prefer. Even biometric locks are available for in-wall safes today. This means you can quickly store a firearm away from curious fingers or put valuables in a safe spot when you’ve got plans away from home. Yet with all of this security in place, you can still have a key override that will give you fast access in an emergency situation. External battery packs may also be available if you’ve installed a wall safe with an electronic lock. This way anyone in the family can have access to your hidden safe should the need arise. Even though these safes install inside of a wall, many of them are either fire resistant or fire proof. They can be as heavy duty as you’d like them to be and many are far more difficult to access than the average gun safe. Because they are bolted to the inside of a wall (or at least they should be), an in-wall safe is quite difficult to remove and it provides some added protection against flood damage should it occur. The final advantage with an in-wall gun safe is that they are rather easy to install. You’ll find that most in-wall gun safes come with an installation template so you can just follow the instructions and have your safe installed in an hour or two at most. The best way to make sure your in-wall gun safe is safe is to install it where your wall can support its weight, but where it won’t be immediately noticeable. A closet or office location is easy to conceal, but also predictable for placement. Consider a basement installation, behind a living room painting, or next to your bed as alternatives. Before sawing into your wall with the template provided, check your wall for the location of any wires. You don’t want to saw through an active electrical cable! A stud finder can also help to make sure your wall safe is going between two studs as intended. You will need to pre-drill holes for your fasteners if you’re using lag bolts to affix your in-wall gun safe to the wall. Some lock fasteners just need a nut driver for a proper installation. Your installation instructions will let you know what tools you’ll need. Then just position the safe between the studs, fasten it securely, and place your firearms inside. You’re good to go. A quick tip: Most in-wall gun safes have a face flange that will overlap the hole that you’ve cut out of your drywall. When you’re measuring what to cut, don’t measure from the flange, measure from the box that is being inserted into your wall. Otherwise the hole you cut will be too big and the wall won’t be able to support your safe. As with any other gun safe, it is important to know what level of storage capacity you’re going to need for your firearms. Many in-wall safes that are small do not have enough depth to safely store a firearm lying on its side. That means finding a way to keep it safe in an upright position and some manufacturers may not recommend storing your handgun in such a way. This causes some homeowners to shop for a larger in-wall gun safe. The only problem with doing this is that your wall must be able to support the safe. You’ll need to have a deep recess or an area of dead space within the wall to support the larger safes in this category. Most walls have a four inch thickness and the larger models may require double this to stay flush with your wall. What Are the Prices of the Best In-Wall Gun Safes? An in-wall gun safe is typically priced about 25% lower than the cabinet-style gun safes that stand alone. You’ll find most entry-level safes in this category begin around $100, but provide very few features other than their ability to stay concealed. For larger safes with more features, you can expect to pay upwards of $300. Most households are going to be able to find a safe that meets their needs for $200 or less, especially if only a handgun or two is what needs to be stored. This in-wall gun safe promotes the best of modern technology into one affordable product. The biometric lock can store the fingerprint scans for up to 120 different authorized users. The design is sturdy enough to fit between two studs, but the slim door profile is flush enough that you could hide this safe behind a mirror or a picture frame and no one would know it was there. A two point deadbolt system protects your valuables and firearms and the addition of two shelves give you the chance to store up to 3 firearms. At just 29 pounds, installation is easy. Give this one a look. With 2 removable steel shelves and foam padding added to protect your valuables, this in-wall safe provides you with the traditional experience that some people want for their home. A simple lock allows you to access this safe with a key. The lock is connected to a 3 point locking system so that the door stays secure in an equalized manner. The one disadvantage here is that you’ll have to drill out your lock and replace it if you lose your keys, so always keep them in a safe place. Made in the USA, this keyless entry in-wall gun safe is the perfect size to help you lock up your valuables. It’s one of the smallest safes in this category, so it will only hold a firearm or two, but that small profile also lets you hide the safe much more effectively. You won’t need batteries for this easy to open safe either. Just punch in your combination and you’re good to go. Although it would be nice to have a recessed exterior for a floor mount, there really isn’t much to complain about. This safe is a great value and it gets the job done. Many in-wall gun safes are designed to fit between the studs in your wall. You cut out the space, install the safe, and have a good storage space for your firearms. Quick Safes has designed a vent safe to work with your existing HVAC system for a unique storage option. It contains RFID keys so there is a heightened level of security as well. You can access this safe in seconds, yet someone could look at the safe and just think it is a regular heating vent. This gun safe proves that sometimes the best protection really is in plain sight. To be fair, this is more of a gun cabinet or wall shelf than an in-wall gun safe, but the concealment of this product is just too good to ignore. It literally looks like a decorative part of your home, yet with a dampener gas spring, you can quietly access a firearm should the need arise. There’s enough space for a couple of guns, a couple of mags, and other accessories that may be needed. It looks like a shelf, but the gun drawer slides out from underneath it. The magnetized key takes some getting used to using, but that really is our only complaint. The best in-wall gun safe reviews will let you take control of your safety. You’ll be able to store a defensive firearm safely and securely wherever you need in your home so that you can always protect the ones you love.